The post Open Source Survey of Alleged Chemical Attacks in Douma on 7th April 2018 appeared first on bellingcat. 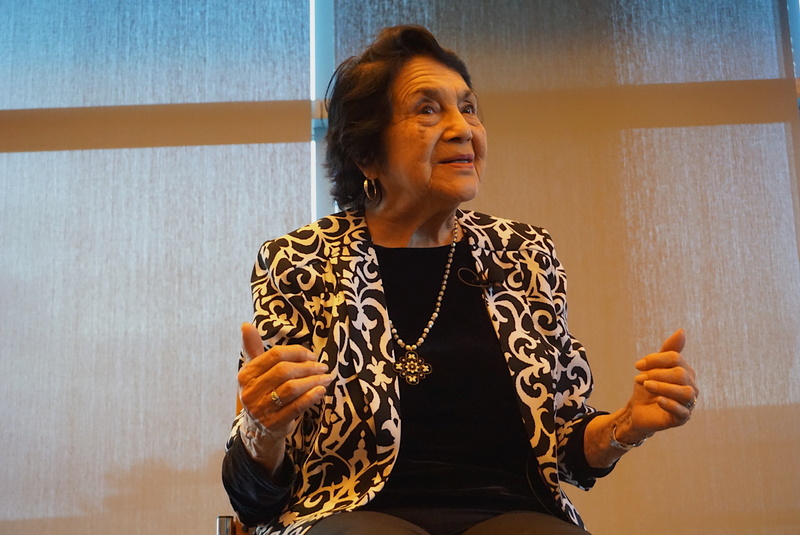 La legendaria activista Dolores Huerta a sus 88 años no solo sigue abogando por las comunidades marginadas, sino que también está creando una nueva generación de activistas. El jueves 5 de abril, Huerta se presentó en la Universidad de California, San Diego y frente a cientos de estudiantes, profesores, y exalumnos ella resaltó la importancia de estar involucrados en sus comunidades y de participar más en la política. “Lo principal que pedimos es que la gente regale su tiempo”, dijo Huerta a La Prensa San Diego. Huerta compartió que el modo de llamarles la atención a congresistas es a través de que la gente se tome el tiempo de hacer activismo, hacer llamadas telefónicas a sus oficinas, y mandarles correos electrónicos. “Se trata de pensar en maneras de presionar a los políticos a que le pongan atención a las necesidades de las comunidades, pero si la comunidad no usa sus voces entonces los políticos no se enteran de las necesidades”, dijo Huerta. Después de años de abogar por los derechos de los trabajadores de campo y sus familias al lado de otro legendario activista, César Chávez, Huerta sigue dedicando su tiempo a abogar por los derechos de las mujeres, el medio ambiente, y los trabajadores a través de su organización la Dolores Huerta Foundation. La fundación se enfoca en ayudar a las comunidades a aprender cómo organizarse para abogar por sus necesidades. Huerta compartió con los cientos de personas en asistencia que los problemas sociales más grandes que están enfrentando las comunidades son la falta de hogares y las personas sin hogares que no tienen acceso a recursos, y las injusticias al medio ambiente. Pero según Huerta, la solución a esos problemas es simple. “La estrategia más importante que necesitamos usar, y se que parece simple, es votar”, Huerta dijo. Huerta también habló de sus experiencias durante el tiempo que se dedicó a abogar por los derechos de los trabajadores de campo. Por mucho tiempo, la mayoría de gente vio a Huerta como la asistente de Chávez, aunque en realidad eran socios, pero ahora ella está compartiendo su labor en la lucha por los derechos civiles de los trabajadores de campo. En un documental titulado “Dolores”, que se estrenó el martes 27 de marzo en PBS se enfoca en el labor de Huerta y los sacrificios personales que tuvo que hacer para abogar por los derechos de los trabajadore de campo. Huerta decidió dejar su vida “normal” y mudarse a los campos para poder tener acceso a los trabajadores y para poder ayudarles a crear una unión. Ella sacrifico tiempo con sus hijos, sus pasiones personales como su amor por la música y el baile pero después de enterarse de las condiciones en las que muchos trabajaban se le hizo imposible no ser parte del movimiento por sus derechos. El documental se puede ver en pbs.org hasta el 24 de abril. The story of Jenny and the Mexicats is one that could have only happened the way it did, with a diverse group of musicians coming together on the road through music. The band, made up of English lead singer and trumpetist Jenny Ball, Mexican buddies Luis “Icho” Dias and Alfonso “Pantera” Acosta, on bass and guitar respectively, and Spanish percussionist David Gonzalez, fuses the worlds of blues, Mexican zapateado, cumbia, jazz, pop, and flamenco to create a sound that reflects the multicultural background and influences of its members. Looking at this eclectic ensemble’s story, it would appear as if its members came together as an act of destiny. In 2008, Ball was touring through Spain as part of a travelling orchestra. During a stop in Madrid, she met “Icho” and “Pantera” at a flamenco bar and instantly connected with their way of thinking about music. The newly-formed bond was so strong that Ball moved to Madrid shortly after her orchestra’s return to England, despite her not speaking any Spanish at the time. With Gonzalez’s arrival to the group, the four-piece was complete and ready to embark on a project which to this day has yielded inventive studio productions and much acclaim from fans and critics. Their self-titled first production debuted in 2011 and introduced the world to their world-influenced, bilingual stylings through songs like “Verde Mas Alla,” “Anthem Song,” “Flor,” and “Me Voy a Ir.” In the process, their debut record earned a certified Gold Record award and international recognition. 2014 would bring “Ome,” their second album and a relocation from the Spanish capital to Mexico CIty. As a result of the move, this new record displays more prevalent influences from Mexican music which could be felt through new hits such as “Boulevard,” and “Frenetico Ritmo.” The album’s lead single, titled “Labios,” was used in the soundtrack to Mexican romance flick “Amor de Mis Amores,” released that same year. 2017’s “Mar Abierto,” their latest studio feature, brings a mature sensibility without abandoning the group’s unique and infectious sound. Songs such as “Why Why” and “Born in the City” capture the sonic mashup of cultures Jenny and the Mexicats is known for, but brings a poignant undertone through the lyrical work of Ball. Today, 10 years after coming together and completing numerous studio projects, Jenny and the Mexicats is celebrating a decade of making music with a tour that will span both sides of the Atlantic and the U.S.-Mexico border. As part of this tour, Jenny and the Mexicats will play at The Casbah in Little Italy on July 25, in what will surely bring fans from both Tijuana and San Diego to experience the band’s unique and diverse style. The celebration doesn’t stop there, however, the band has also released a nostalgic video which calls back to the early days of this project, revealing the experiences which have lead this group to become a favorite among many. The story of Jenny and the Mexicats is one that could have only happened the way it did and today, 10 years later, it is a story that continues to show that for music there is no nationality of borders. As the prospect grows of military confrontation with Russia in the skies over Syria, the US is counting on support from European partners such as France and the UK. But help from a key regional ally – Turkey – is less certain, despite its position on Syria’s northern border and opposition to Bashar al-Assad’s regime. There are echoes of 2003, when Turkey refused to back the US-led invasion of Iraq. Whose side Turkey is on is a question increasingly exercising Washington policymakers as Recep Tayyip Erdoğan, Turkey’s president, builds closer ties with Russia. “Uh-oh, Trojans coming through! Uh-oh, Trojans coming through!” shouted the three dozen members of the Douglas high school marching band as black and Latino teenagers banged on drums and set the beat. Oklahoma’s teachers may not have won their call for increased wages and funding for education – yet. But after completing a 110-mile march from Tulsa to Oklahoma City to highlight the parlous state of their school system there was an air of expectation and excitement as they and their supporters reached the state capital. Limited to only national parks, the view still provides a good idea. For a model-based view at higher granularity, check out the USA National Phenology Network. Google’s helping the Pentagon to build AI for drones, and a vocal group of employees have asked the company to drop the project.